Arthur Daemmrich, director of the Smithosonian’s Lemelson Center, introducing the creators of Spacewar! Long after I’m dead, if the country remains unscathed, there will be a recording with me on it in the Smithsonian. On it, I will be heard asking the developers of Spacewar! if they had any idea what the video game industry was going to become when they made their game in 1962. 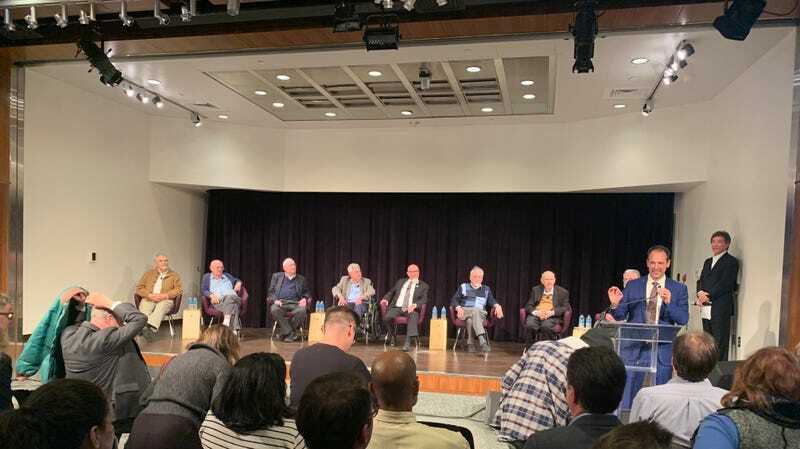 The recording will include the answer, uttered simultaneously by several of these men, all in their late 70s and early 80s on a night meant to honor their achievement: no. We had this conversation last Thursday. I’d taken an Amtrak from New York to Washington, D.C. and hurried over to the Museum of American History for the inaugural Video Game Pioneers Initiative event that was set to honor the makers of Spacewar, one of the earliest video games ever made. I sat down with the seven surviving members of Spacewar’s development team, a group of guys who created the game in their 20s while they worked at the computer lab at MIT. Their project, meant to test what a state of the art 1960s computer could do, unintentionally helped launch the video game artform. “We were just having a good time,” Martin Graetz recalled. “We wanted to find out what we could do with this shiny new toy,” Steve Russell added. The “practically anything” they did create was Spacewar!, a two person game where each person pilots a spaceship and fires torpedoes at the other player. These ships are set on a realistic starmap, and revolved around a star in the center of the screen that has a gravitational pull. The goal is to destroy the other ship with your torpedoes while avoiding being pulled into the star. The National Museum of American History was built in 1964, just two years after the creation of Spacewar!, during the Cold War. Originally the museum was intended to show off American technology, according to Arthur Daemmrich, director of Smithsonian’s Lemelson Center, and when it first opened, it was called The Museum of History and Technology. It now attempts to tell the story of American historical accomplishments, from our innovations, to significant moments of change in our culture, to our popular media. On the way in, I passed the Batmobile from Tim Burton’s Batman. Currently on display is an exhibit about superheroes and a Woolworth’s lunch counter from the then-segregated North Carolina. It’s strange to see all these things treated with reverence and respect next to each other. Spacewar!, they told me, was made for the same reason a lot of college kids make things: for fun. While working with professor Jack Dennis, these young programmers got wind that a new computer, the PDP-1, and a state of the art display, was coming to the lab, and they wanted to show people what it could do. They decided a game would work and convinced Dennis to sign off on the project. As much as it was an academic exercise, it was also an entertaining diversion. They spent so much time playing their own game that Dennis eventually told them that they could not play Spacewar! except during lunch hour and after five or six at night. Of course the developers were going to like it. At the time Graetz said they were all “thoroughly steeped” in science fiction novels and movies, and the game coalesced out of their shared interests. But the game wasn’t just a hit among Russell and his collaborators. It soon become a bit of a fad across campus. Despite the deep respect that people currently in the industry bestow upon them, when I asked if they played games, the answer was an immediate and resounding, “no,” from all parties present. “It’s just that I other things to do that really required some time,” Saunders said. I spoke to Spacewar’s creators for about an hour, and then we were whisked to a VIP reception upstairs. Waiters served us hors d’oeuvres—chicken wings, beef tartare, and thankfully, tabbouleh and asparagus canapes. Behind the nearby couches was a TV screen in the wall endlessly playing clips from landmark games through all eras of gaming. A trailer for Earthbound bled into one for Firewatch, the original Red Dead Redemption, Minecraft. Waiters carried trays of wine and sparkling water, which were eagerly drunk by the very important people I suddenly found myself surrounded by. On my way up, I spotted Bethesda chief game creator Todd Howard. I took a moment to say hello before we were ushered into a freight elevator to attend the night’s panel discussion, which was open to the public. He told me that he thought the event was very impressive. We were standing only a couple feet away from a mural of Fallout’s Vault Boy. Over the course of the evening, I heard Spacewar!’s developers repeat some stories a couple of times. In a brief video introducing the panel discussion, Russell said that although they had created a sophisticated and—for its time—realistic simulation of how gravity works in space, they couldn’t get it to work on torpedoes. So they decided they were photon torpedoes not affected by gravity. He told that story again during the panel discussion itself. I couldn’t blame them. I also only tell a few stories from college, and my friends have definitely heard them all. I’ve just never done anything that has helped spur on an entire entertainment industry, unless you count “getting my friends to laugh at that one story about the guy who got so drunk he pissed his pants during orientation week” as an entertainment industry. The evening was less about learning about the history of this game, as its been dissected before. It was more a chance for The Smithsonian to start telling the story of video game development in America. The organizers say they hope events like this will help young people to think of themselves as innovators and creators, as well as commit these stories to record while these people are still alive. During the panel discussion, and especially the question and answer session, Spacewar!’s developers were charming, though clearly tired. These are all people with illustrious careers not relating to the video game industry at all, and they’re all close to eighty years old. By the time they were presented with an award, though honored, a bit of their zip had left them. As they were given their second standing ovation of the night, they bowed. After the question and answer session was over, I wandered over to the display where the game could actually be played. I hadn’t been born when it was released, and hadn’t played it at all. As I waited in line, a mother and daughter played against each other. No one else could pry them away from the console. I had been watching this pair for a while—they’d sat near me during the panel, and I’d wanted to ask them what they thought about it. The daughter had pulled up her feet to sit cross legged while she listened, looking bored with her head resting on her palm. Asking random people things is now an instinct I have after years of doing it for a living, and I’ve long grown past being nervous or embarrassed by it. Watching that mother and daughter, on that night, I decided not to interrupt them. I’d wait my turn, if they let me have one, and let them touch history in peace. The little girl was playing a game, of course. But just playing around, the night had proven, could someday lead to making something that should be in a museum.